Back Row (L to R): Patrick Hurney, Jason O'Brien, Patrick Lynch, Mark Gorman, Cian Moloney, Ronan Fleming, John Cosgrave. Second Row (L to R): Darrell Ryan, John Kindregan, Mark Fives, Shane Donnelly. 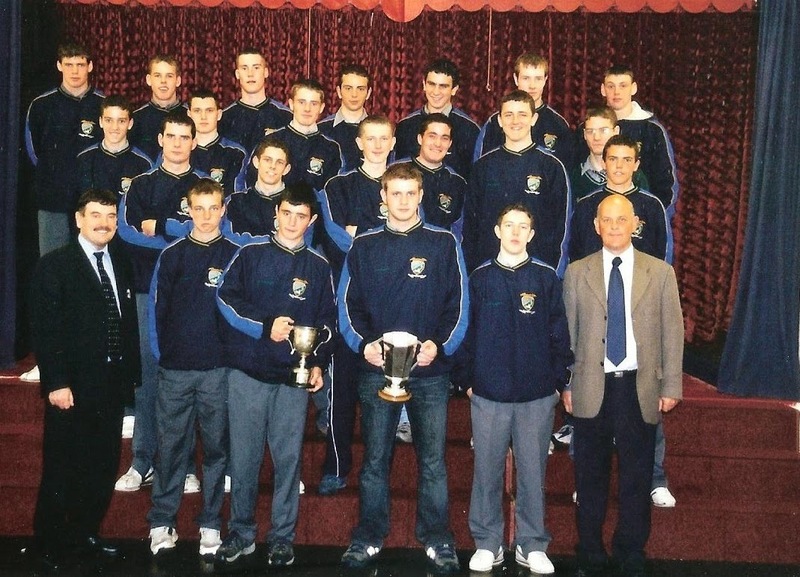 Third Row (L to R): Peter Phelan, Joey Mullen, Eoin Enright, Séamus Shields, Michael Browne, Anthony Whelan. Front Row (L to R): Finbarr Keohan (Principal), Mark Ferncombe, Eddie Casey, Simon Hanrahan (Capt. ), Tiernan Murray, Bernard Gorman (Manager). This week's photo shows the Abbeyside Minor Hurling Panel that completed a Western and County Double in 2003 on a visit to Scoil Mhuire where many would have first learned the skills of the game. Victories over Dungarvan Gaels and St. Patrick's set up a Western Final against Lismore. The County Final against De La Salle, played at Walsh Park in October, was a tight affair with the boys coming out on top by five points, 2-10 to 0-11. This win secured a first County Minor Hurling Title in 27 years. Our ever popular Jack the Joker fundraiser continues this Sunday night in Alice O’Connor’s Bar where the jackpot is €4,750. On Sunday night last Johnny Jackson was drawn out and chose card number 11 which wasn’t the Joker although he did win €50. Nuala Keneally and Owen Hahessy won €25 each. As well as our group of ticket sellers tickets can be purchased from Convenience Store Ballinroad, Village Flowers, Spar, Mousies Takeaway, Minnies Bar and Crottys Corner Bar. Our under 21 footballers got their Championship campaign underway last Sunday in Fraher Field when they took on St. Olivers in the first round of the Western Championship. At the end of a very competitive game our young team were defeated by two points as our more experienced opponents finished the game strongly. Despite losing this game the team can feel very proud of their performance here and they now play Clashmore this Friday night in Abbeyside at 8pm in the losers group section of the Championship. TEAM: K. DWANE, C. McCARTHY, B. LOOBY, S. O’GORMAN, C. DWYER, E. BERGIN, J. DUGGAN, C. PRUNTY, J. ELSTED, C. McCARTHY, D. LOOBY, M. MAHER, L. POWER, S. CLIFFE, M. COLEMAN. SUBS: D. SWEENEY, N. MONTGOMERY. This Wednesday night our Senior Hurling team will take on the County Under 21 Hurling team in a challenge match in Fraher Field. Our Club Bingo will continue this Sunday night in the CBS Hall where the jackpot is €1,000. Our under8 hurlers take part in a blitz this coming Saturday in Ballinameela. They started off their season last weekend with another blitz this time in Bohadoon and all the kids that partook seemed to enjoy themselves greatly. After this blitz training will continue for this group on Saturday mornings between half past ten and half past eleven starting on Saturday the 7th March. Our outdoor hurling sessions start up again on Saturday morning the 28th February at our club grounds. These sessions will include under 6, 7 and 8s and will run from 10.30 to 11.30. The under 8s will not train the first day but will start the following week due to taking part in a blitz. Our under9 team will train between the time of11.30 and 12.30 at our wall ball. All are welcome to attend and it would be great to see some new faces. Helmets will be available to buy at a discounted rate at these sessions. This group will train on Friday evenings at the club grounds, the under 10 team between the time of 6 and 7 and the under 11 and under 12 teams between 7 and 8. Again all are welcome. Our under 16 football team start their championship this Sunday morning at 11 o clock at home to our near neighbours, Dungarvan. We wish all involved well. This week's photo comes from 2003 and shows the Ballinacourty panel and mentors who defeated The Nire in the Western U21 Football Championship Final played at Cappoquin in May. The lads subsequently went on to claim victory in the county decider, these two titles adding to the other 5 Western and 4 County crowns captured in that tremendous year. Our ever popular Jack the Joker fundraiser continues this Sunday night in Alice O’Connor’s Bar where the jackpot is €4,550. On Sunday night last Brendan Mansfield was drawn out and chose card number 40 which wasn’t the Joker although he did win €50. Richie Cosgrave and Dylan Hogan won €25 each. As well as our group of ticket sellers tickets can be purchased from Convenience Store Ballinroad, Village Flowers, Spar, Mousies Takeaway, Minnies Bar and Crottys Corner Bar. On Sunday night last there was very large crowd present in Minnies Bar for the by now Annual Abbeyside Sports Awards and it was great to see some club members honoured for their work in the community. Bernard Shields, Rogie Cashin, Gavin Breen and Stephen Enright were all honoured for their commitment and dedication to the club over a long number of years. Our under 21 footballers get their Championship campaign underway this Sunday in Fraher Field when they take on St. Olivers at 2pm. Our Club Bingo will continue this Sunday night in the CBS Hall where the jackpot is €950. Our under 9 outdoor hurling training sessions started on a Saturday morning during January at the wall ball and will continue every Saturday at 11.30. Our under 8 hurling season gets under way on Saturday the 21st February with a blitz organised for Bohadoon. They also have a blitz in Ballinameela hall on Saturday the 28th February. Our minor football team travelled to Kilmacthomas on Sunday morning last to take on St Declans of Kilmacthomas. After a hard fought encounter our lads came away with a win on a scoreline of 2-8 to 3 points. This group now have a few weeks off before their next match. Our outdoor hurling sessions start up again on Saturday morning the 28th February for the under 5s to under 10s inclusive from 10.30 to 11.30. All are welcome and helmets will be available to buy on the day. The under 8s will not start up this day as they have a blitz that morning in Ballinameela but they will start up the following week. 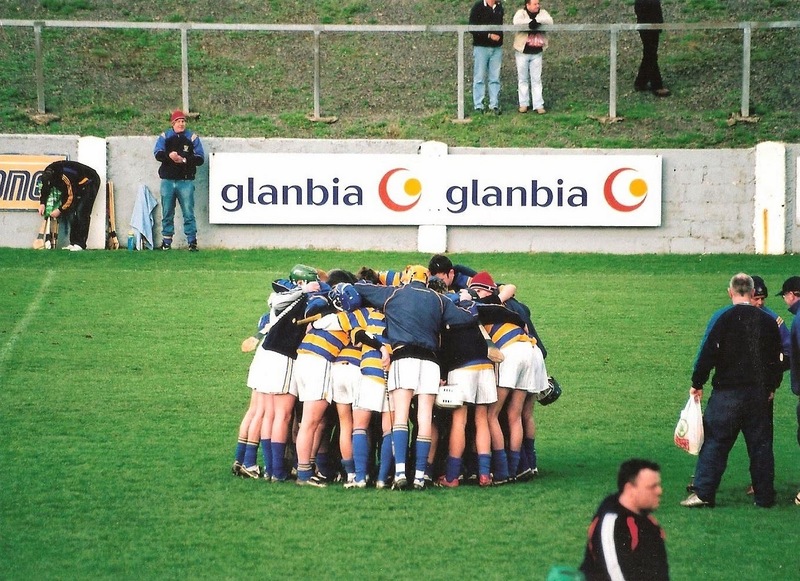 This week's photo comes from 2007 and shows the Abbeyside pre-match huddle before the County U21 Hurling Final against De La Salle played at Walsh Park on 22nd December. Following a pulsating clash which included extra time, the Village boys captured the title, 1-18 to 1-17, to secure only the club's fourth win at this grade, but the third in four years. Our ever popular Jack the Joker fundraiser continues this Sunday night in Alice O’Connor’s Bar where the jackpot is €4,350. On Sunday night last James, Jack and Joey were drawn out and chose card number 24 which wasn’t the Joker although they did win €50. Packie Hurney and Kay O’Connor won €25 each. As well as our group of ticket sellers tickets can be purchased from Convenience Store Ballinroad, Village Flowers, Spar, Mousies Takeaway, Minnies Bar and Crottys Corner Bar. Waterford footballers suffered their first defeat of 2015 on Sunday last when they were defeated by Offaly in Tullamore where Stephen Enright, Michael O’Halloran, Patrick Hurney and Mark Ferncombe were all on the team. They now have a three week break to the next game against Carlow. Our Club Bingo will continue this Sunday night in the CBS Hall where the jackpot is €900. Due to the unavailability of the Friary College because of exams our outdoor hurling this year will start earlier than in previous years. Because of these exams we will not be able start back again indoors and so we will start our outdoor sessions in mid February or early March weather permitting. We would like to thank all of the people in the Friary with the co-operation in regards to this matter. Helmets etc will be available to buy at a discounted rate at these new sessions and all are welcome. Our under 8 hurling season gets under way on Saturday the 21st February with a blitz organised for Buhadoon. Our under 12 hurlers are just after finishing off a three week hurling tournament in Tramore. Over the weeks there was a constant improvement in our side and all the players involved enjoyed themselves and got plenty of game time. Well done to all. Our minor football team got their championship up and running last Sunday morning at our own club grounds against Tramore. After a very good display they got their campaign off to a winning start. They now take on St Declan’s of Kilmacthomas on Sunday morning next away from home and we wish everyone involved well. L to R: David Power, Stephen Enright, Seán O'Hare, Jason Healy, Eoin Brackett, James O'Mahony, Mark Ferncombe, John Gorman. 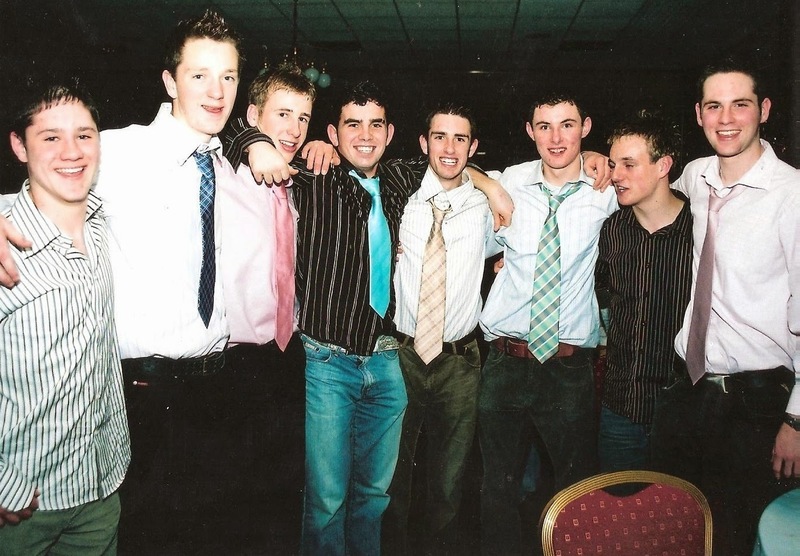 This week's photo comes from early 2008 and shows some of the club's younger players enjoying the social to mark the very successful playing year of 2007. Among the titles won included County Senior Football, Western & County Junior Football, Western & County U21 Football, Western & County U16 Football, Western & County Junior Hurling and Western & County U21 Hurling. Our ever popular Jack the Joker fundraiser continues this Sunday night in Alice O’Connor’s Bar where the jackpot is €4,150. On Sunday night last Pat Walsh was drawn out and chose card number 24 which wasn’t the Joker although she did win €50. Neil Moore and Irene c/o Joe Riordan won €25 each. As well as our group of ticket sellers tickets can be purchased from Convenience Store Ballinroad, Village Flowers, Spar, Mousies Takeaway, Minnies Bar and Crottys Corner Bar. Our minor footballers will get their County Championship campaign underway this Sunday morning when they take on Tramore in Abbeyside at 11:30 am. Waterford footballers continued their excellent start to 2015 with a good win over Wicklow in Fraher Field on Saturday night last where Stephen Enright, Michael O’Halloran, Patrick Hurney and Mark Ferncombe all played their part in the victory. We wish them all the very best of luck ahead of their next league game against Offaly in Tullamore this Sunday. On behalf of all in the club we would like to extend our hearties congratulations to Niamh Briggs on two notable achievements during the last week. Firstly during the week Niamh was named as captain of the Irish Ladies Rugby team which is a remarkable achievement by Niamh and a wonderful honour for all her family. Then to cap off the week, on Saturday night, she was named as The Park Hotel Supreme Sports Star for the second year in a row. On Thursday night Niamh was guest of honour at our underage medal presentation and it is fantastic that such an international sports star such as Niamh continues to help out our club whenever she can. We would ask all players to please make an effort to get their membership fees paid as soon as possible as any player who suffers an injury in training or matches is not covered by insurance unless they have paid their membership. Our Club Bingo will continue this Sunday night in the CBS Hall where the jackpot is €850. This Friday night we are holding a fundraising table quiz in Minnies Bar at 9 pm. Teams of 4 cost €40 and as always it promises to be a most enjoyable night so we ask all our supporters to please come along on the night and show your support. Our under 8 hurling season gets under way on Saturday the 21st February next with a blitz organised for Buhadoon. Our minor football team get their championship going this Sunday morning the 8th February at home at the club ground to Tramore at 11:30 am. We wish this team and their mentors well for the forthcoming year. There was a great turnout in Ballinroad Hall on Thursday night last for our medal presentation. It was great to see so many youngsters collecting medals on the night for their playing achievements on the field in 2014. Our guest speaker on the night was Niamh Briggs and we thank her most sincerely for attending. Also to Tomás Kiely who was our MC on the night a big thank you must go to also. A special award was presented to outgoing treasurer of the juvenile section of the club Kevin Tobin for his outstanding work with the club throughout the years. Overall a very nice evening was had by all present and a thank you must go to anyone who put work into the night to make it the success it was.